​Lake Country Life Teen is a dynamic Catholic middle & high school ministry program for teens in the Lake Country area of Wisconsin (Western Waukesha County). At Lake Country Life Teen, our mission is to invite young people to meet, know, love and serve Christ. We believe that the typical “CCD” or “religious education” provided at most parishes, while helpful and formative, often do not meet a young person’s thirst for an encounter with the Person of Jesus Christ and do not help foster a living relationship with God. 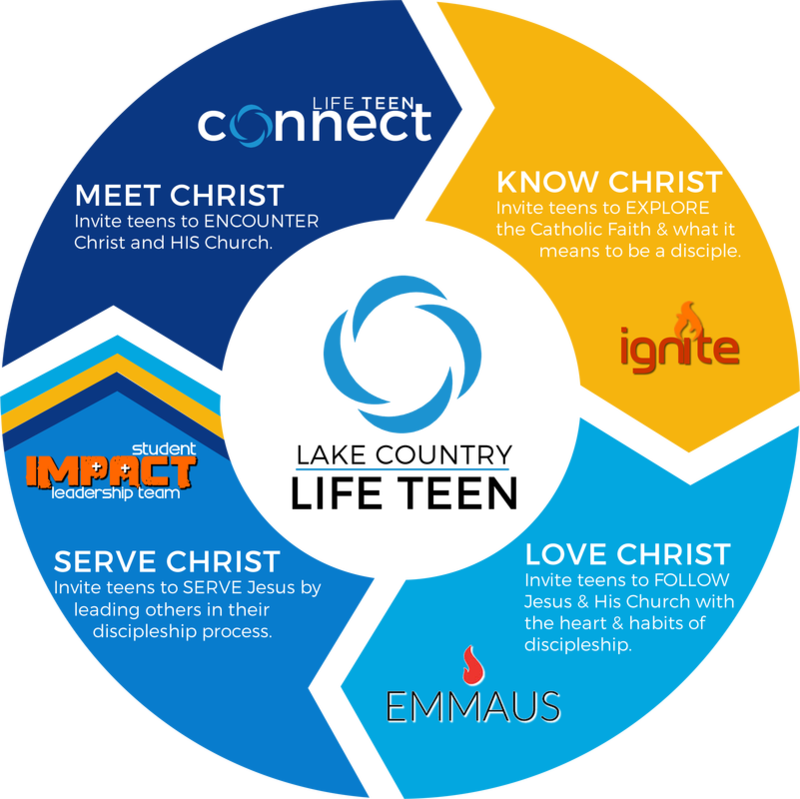 We strive to provide the opportunity for young people to meet, know, love and serve Christ through our simple discipleship process (see below). This process includes a bunch of fun and engaging Eucharistic-centered relational ministries. Sociology has found that there are 5 driving needs of teenagers. If these are not met, they cannot begin to hear, relate, and understand the Gospel message. 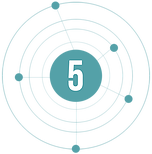 We strive to meet these needs through our simple discipleship process that focuses on the use of small groups. Meeting with a small group of same age, same gender teens allows our students to be understood, to belong, and feel free to be transparent. Each small group is led by an adult leader who facilitate the presentation and discussion of topics about faith and life. This meets the needs of critical thinking and guidance. They establish trust, faith sharing, and accountability, and provide guidance to the teens as they grow in their relationship with Jesus. First, we need to Meet Christ. We need to have an encounter with Christ; to come to believe there is a God in our hearts and understand how much HE loves us. That HE desires for us to have a personal relationship with HIM. This is an important first step that most Catholic parishes skip over, they instead attempt to educate first in hopes that belief will follow. But we find that it is easier to learn about Christ after being convicted of HIS love for us. We offer a number of Encounter Retreats at the beginning of each year in conjunction with Life Teen Connect to help teens meet Christ. Second, we come to Know Christ. After encountering Christ we desire to know more about Christ and HIS Church. We do this through our Sunday night IGNITE ministry where high school teens gather together, hear a message, discuss in small groups, and worship God. Third, we are called to love Christ. This is done through high school small groups called Life Groups. Each Life Group is made up of 10-12 students and a core team member who meet at a minimum of twice a month to dig deeper into scripture and Church teaching. They also do service projects together. Next, we Serve Christ. As we become disciples, we are called to bring and lead others along on the journey. All of Jesus’s disciples had disciples that they mentored. We are called to serve other teens in our Life Teen ministry through the process by being a part of our Student Leadership team or a parish ministry; like a liturgical ministry, St. Vincent de Paul, and others. As disciples we know that we cannot give to others what we do not have, so we constantly seek to encounter Christ, know more about him, and love others as we walk with others in their discipleship journey.